Kumihimo braids are very similar to the friendship bracelets that young girls often make for each other out of embroidery floss or thick strands of rubbery plastic. The simplest looping techniques involve four or five threads that are looped through each other to create the appearance of slanted stripes in alternating colors. The threads can be knotted in opposing directions that meet in the middle to make a V shape. The same alternating knotting process can be tweaked to result in intricate lattice patterns. Distinct images can be embedded or embroidered into the fabric of a flat kumihimo. If the threads are pulled overly tight at specific intervals, the cords can be molded into curved shapes with sculpted borders. Few American crafters progress beyond basic loop or box patterns when making their handmade jewelry, but kumihimo is a flourishing, significant industry in Japan. Context transforms an inconsequential summer camp pastime into something that is taken quite seriously in Japan. Kumihimo disks are made out of flexible plastic or hardened foam. They are usually about six inches in diameter and have up to 24 slots placed evenly around their entire circumferences. The kumihimo hangs downward through a hole in the disk. The threads are detached from their secure slots when they are being used to make knots and placed in new slots when they need to be held taut. These disks are great for beginners because they keep all of the threads organized and separate on an even viewing field. The cord is kept out of the way as it grows longer. The cords that are made on disks are round and have even patterns. Disks are not suitable for experienced braiders who want to make cords that would be too thick to fit through the central hole in a begginer’s disk. A maru dai is a wooden apparatus that looks like a miniature stool. A braider can hone the skills she learned from her disk on a maru dai. A maru dai stands up on its own, freeing up the braider’s hands to create intricate patterns without worrying about also keeping a disk steady. 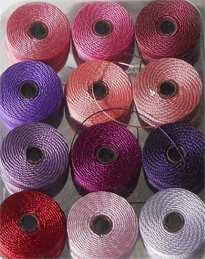 It does not have slots to hold threads in place, instead relying on weighted bobbins to provide the necessary tension. The braider can use as many threads she wants in whichever formations she chooses, since she will not be limited by evenly placed slots like the ones on a disk. A maru dai will help a braider graduate from round cords to flat graphic ones. The kaku dai is an inverted maru dai. The finished expanse of the cord is held upward on a stand, and the weight of the hanging bobbins keep everything secure. 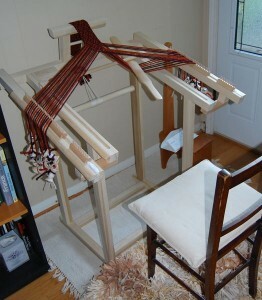 One type of loom is a karakumidai, which takes a long time to master. The braider needs to learn how to maintain a delicate balance of tension. This tension is more important than the braiding technique when this tool is being used. 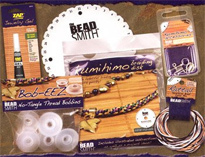 Starter kumihimo kits are available from multiple online retailers for under $20. A kit usually includes a disk, a brief instruction manual and enough thread to make a few cords. The tools used to make kumihimo become more complicated and difficult to use in accordance with the complexity of the designs that the braider would like to create. The largest looms that require the most skill to operate produce kumihimo cords that are so thick and ornate that they resemble slender strands of woven fabric. Authentic maru dai stands can be a little difficult to acquire. They are only sold by specialty merchants and cost over $100. A maru dai may be delivered in pieces that the braider has to assemble herself. She will have to do research regarding complex braiding techniques, since they are beyond the scope of booklet from a starter set. 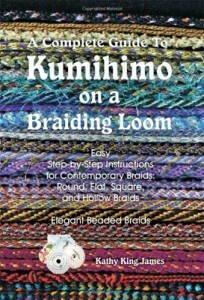 Many kumihimo enthusiasts have uploaded videos demonstrating how to do basic knots on a maru dai. A creative braider will probably enjoy being left to her own devices when inventing her own techniques. HI, I want to tell you how this helped my husband after a had a stroke. He could not touch his fingers together on this left hand. After I showed him how to do this it has helped him so much that he can now. It also helped his brain because he has to remember where to put the strings. When we showed his DR. he told my husband to keep up the good work. He loves doing it and I think I have 100 of them now so I started to make jewelry out of them. We are going to sale them at the craft show on Sat. WISH US LUCK.